have a second sign board? have a second sign board?Please place this order and then make a second purchase of a board of the same size with no post. have a second sign board?Please place this order and then make a second purchase of a board of the same size with no post. have a second sign board?Please place this order and then make a second purchase of a board of the same size with no post. have a second sign board?Please place this order and then make a second purchase of a board of the same size with no post. I am a craftsman based in The New Forest National Park, I personally hand select the oak for everything I make. I do not have a production line, I make to order and carefully consider every sign I create adding the personal touch to my work. Perfect for a moving in gift, newly wed present, or to add additional curb appeal to your home. all sign sizes are a very close approximation. This is due to process of sanding and planing of the wood when working and finishing them. Large Square Sign - 33x33cm Information Board with a whopping 70 characters over 7 lines. We also make custom signs on request. The number of engraved letters/number etc is your choice. The general rule is the less characters the bigger they can be engraved, the number of characters in the options are advised based on optimising the number of characters to fill the availible space. More charcters can be chosen, but with longer words per line will result in the lettering having to appear smaller. Example images can be made after ordering to fine tune your order. Example - The characters can be engraved on a single line or over two, such as - Regular Rectangle sign can have either 7 letters and numbers on 1 line, or two lines of 7 making a maximum of 14. Posts - The sign can come with one post in the centre or two posts towards each ends. 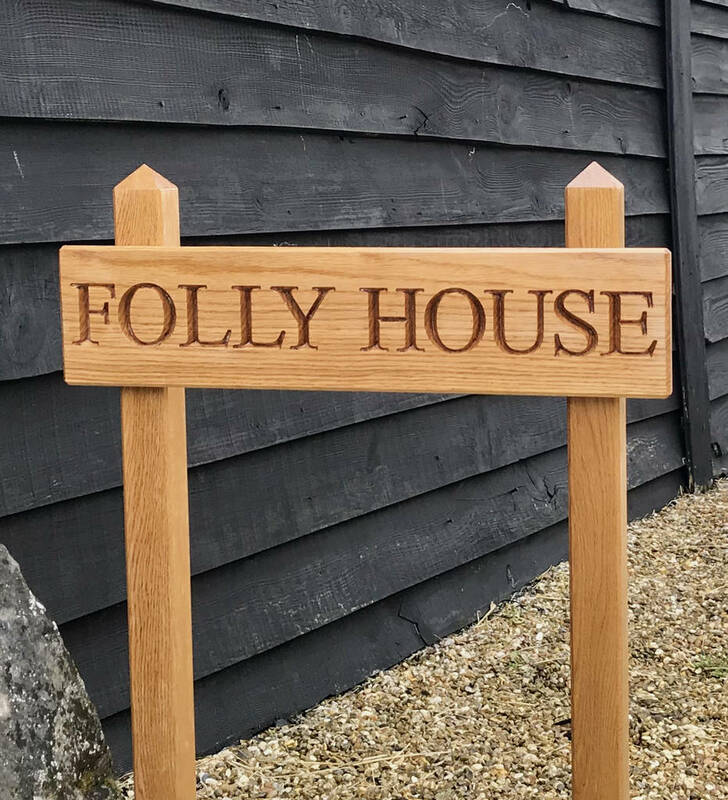 Character colour - The engraved letters can be left natural and oiled or painted black. All signs will have with three coats of Superios Danish Oil to protect from the elements and UV rays, unless otherwise specified. 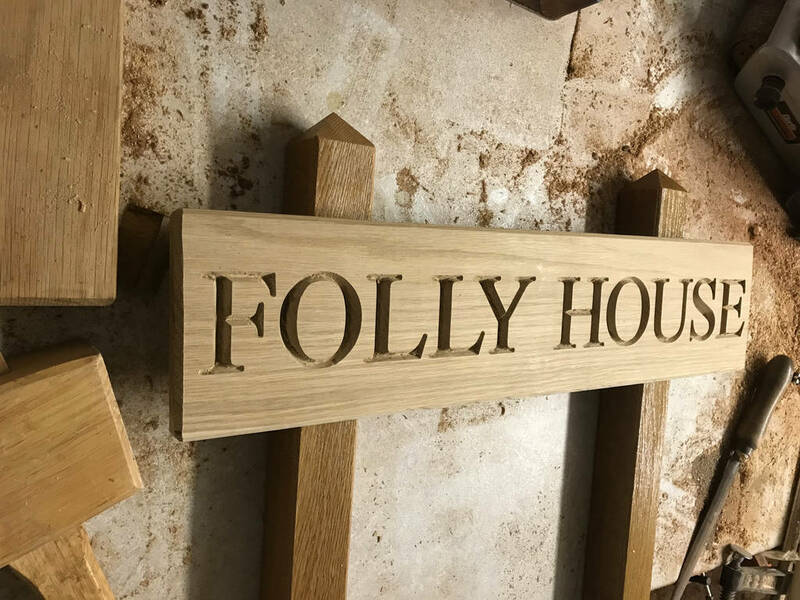 At House fo Carving we spare no expense is both materials and time to make our superior solid oak house signs. 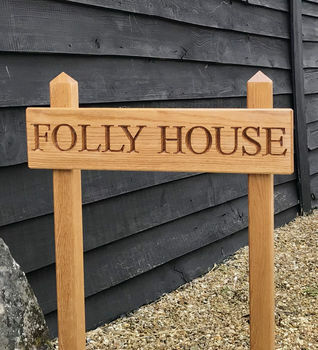 My signs are chunky and strong for stability and long life, your sign will be handcrafted from oak hand selected from the wood mill. Rather than ordering wood in bulk to the workshop, every section of timber is picked and chosen to come back to the workshop. We actually visit the wood yard and spend climbing over and sifting through the timber looking closely at the wood grain structure, colour and a number of other factors which now comes naturally to us. This way we start ahead of the competition by only having the best oak in our products, only the cream of the oak make it! Your sign will arrive with guidance on how attach the posts with the predrilled holes and screws. And advice on installation. Wood naturally silvers over time, and we expect all our signs to beautiful silver too. If you wish to delay this weathering process we recommend applying another coat of oil after 3 months, and then every 6 months after that, this will nourish to the wood, enhance the colour and protect from wet weather. 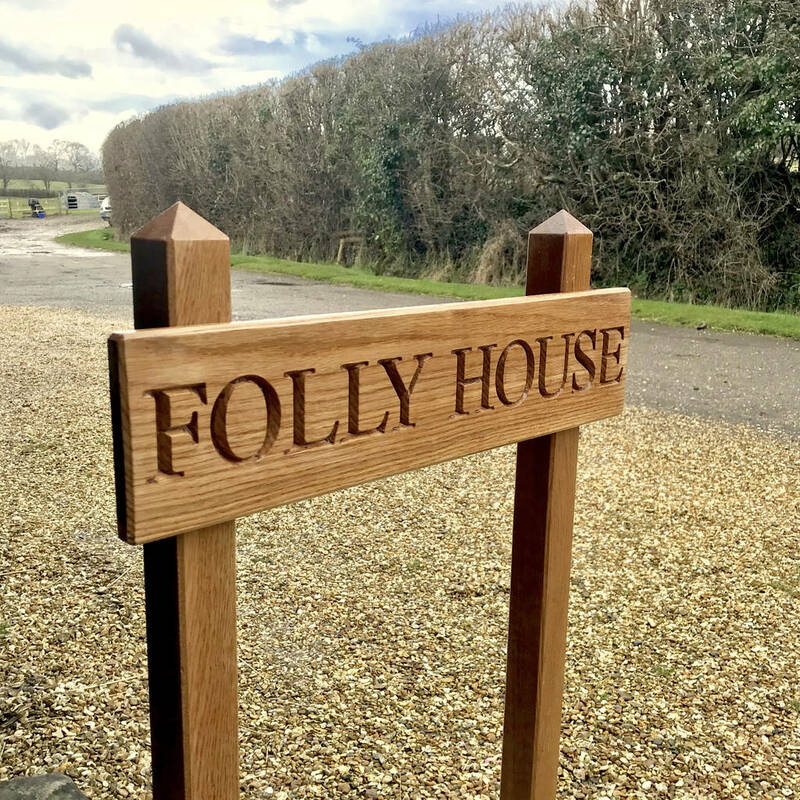 You may also want a second sign board attached for 'PRIVATE ROAD' or 'ESTATE OFFICE' Please order another sign without a post(s).